The Bulls players huddle around Head Coach Lance Leipold following the team's first practice at UB Stadium. 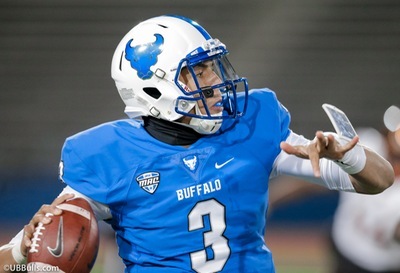 The most anticipated season in UB Bulls football history got started early on Friday morning, under cloudy skies at UB Stadium. The team kicked off training camp, just shy of one month before their September 1 season opener at home vs. Delaware State. It was the first chance to see how the team will lineup, gauge the competition at various positions, and see which new players are preparing for prominent roles. Here are some notes from the first workout, held without pads. *The team is healthy, with just two key backups being held out of full action. Backup running back Theo Anderson and reserve cornerback Aapri Washington were the only players wearing the red jerseys. *Quarterback Tyree Jackson physically looked great, as a summer of working out has refined his body and muscles. Jackson threw the ball well, and the power on his sideline out throws were especially noticeable. *Jackson and the other quarterbacks were throwing to a group of new receivers. Returning starters K.J. Osborn and Antonio Nunn were there, but star wideout Anthony Johnson’s practice appearance was cut short by class requirements. That gave a chance to some new players who will compete for backup spots, including Charlie Jones, Isiah King and Rodney Scott. *One new receiver is grad transfer George Rushing. He comes from Wisconsin, where had 18 career catches. He’ll be a nice veteran presence behind the three starters. *The running back competition will be one to watch, and the one that Leipold singled out as an area of interest for the coaches. Returning starter Emmanuel Reed is #1, followed by veteran Johnathan Hawkins. With Anderson injured, redshirt freshman Kevin Marks spent some time with the starters. He’s the Bulls fastest back, and look a little like UB star James Starks based on Mark’s long, lean body type. Freshman Jaret Patterson also got plenty of reps.
*The defense added a potentially key new player. Ashton White is a transfer from Notre Dame, where he sat out last year. White saw reps with the second team, as the Bulls are searching for two new starters at safety. *One linebacker spot is open, and right now it belongs to freshman James Patterson, Jaret’s twin brother. He’s a solidly built six foot, 230 pounds. *Middle linebacker Khalil Hodge celebrated his 21st birthday with the opening practice. Hodge looked even more muscular than last year, when he was 2nd in the nation in tackles. *Jackson had a busy offseason, spending time at the Manning Passing Academy and working out with NFL quarterbacks. Buffalo Sports Page talked with Jackson about those experiences, and we’ll have a full story this weekend.